Gioachino Antonio Rossini (Italian: [dʒoaˈkiːno anˈtɔːnjo rosˈsiːni]; 29 February 1792 – 13 November 1868) was an Italian composer who wrote 39 operas as well as sacred music, chamber music, songs, and some instrumental and piano pieces. His best-known operas include the Italian comedies Il barbiere di Siviglia (The Barber of Seville) and La Cenerentola (Cinderella), and the French-language epics Moïse et Pharaon and Guillaume Tell (William Tell). 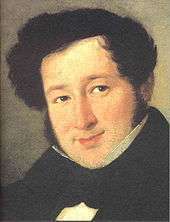 A tendency for inspired, song-like melodies is evident throughout his scores, which led to the nickname "The Italian Mozart." 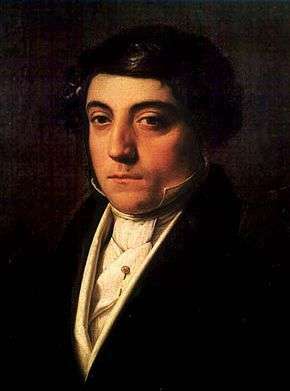 Until his retirement in 1829, Rossini had been the most popular opera composer in history. He was a prolific composer, and was quoted as joking, "Give me the laundress' bill and I will even set that to music." 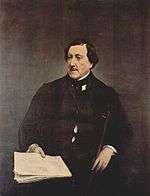 Gioachino Antonio Rossini was born into a family of musicians in Pesaro, a town on the Adriatic coast of Italy that was then part of the Papal States. His father, Giuseppe, was a horn player and inspector of slaughterhouses. His mother, Anna, was a singer and a baker's daughter. 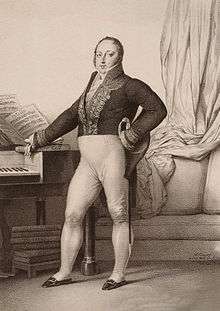 Rossini's parents began his musical training early, and by the age of six he was playing the triangle in his father's musical group. He was eventually taken from Prinetti and apprenticed to a blacksmith. In Angelo Tesei, he found a congenial music master, and learned to sight-read, play accompaniments on the piano and sing well enough to take solo parts in the church when he was ten years of age. Important products of this period are six sonate a quattro, or string sonatas, composed in three days, unusually scored for two violins, cello and double bass. The original scores, dating from 1804 when the composer was twelve, were found in the Library of Congress in Washington D.C. Often transcribed for string orchestra, these sonatas reveal the young composer's affinity for Haydn and Mozart, already showing signs of operatic tendencies, punctuated by frequent rhythmic changes and dominated by clear, songlike melodies. 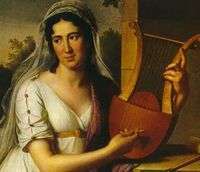 In 1822, four years after the production of this work, Rossini married the renowned opera singer Isabella Colbran. In the same year, he moved from Italy to Vienna, where his operas were the rage of the audiences. He directed his Cenerentola in Vienna, where Zelmira was also performed. After this he returned to Bologna, but an invitation from Metternich to the Congress of Verona to "assist in the general re-establishment of harmony" was too tempting to refuse, and he arrived at the Congress in time for its opening on 20 October 1822. Here he made friends with Chateaubriand and Dorothea Lieven. The opera Semiramide was first performed at La Fenice in Venice on 3 February 1823. It was Rossini's last Italian opera. His first wife died in 1845, and on 16 August 1846, he married Olympe Pélissier, who had sat for Vernet for his picture of Judith and Holofernes. 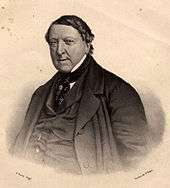 Political disturbances compelled Rossini to leave Bologna in 1848. After living for a time in Florence, he settled in Paris in 1855, where he hosted many artistic and literary figures in his apartment at 2 Rue de la Chaussée-d'Antin, among whom the forty years younger Belgian mattauphone virtuoso Edmond Michotte, considering him as his quasi figlio. 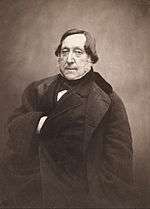 Rossini had been a well-known gourmand and an excellent amateur chef his entire life, but he indulged these two passions fully once he retired from composing, and today there are a number of dishes with the appendage "alla Rossini" to their names that were created either by or specifically for him. Probably the most famous of these is tournedos Rossini, still served by many restaurants today. The Library of the Royal Conservatory of Brussels possesses an important collection of scores, documents and objects from Rossini, assembled in the Edmond Michotte fund. 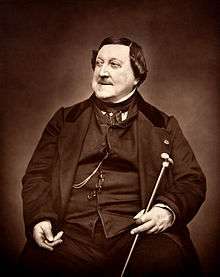 A characteristic mannerism in Rossini's orchestral scoring is a long, steady building of sound over an ostinato figure, known as a "Rossini crescendo", creating "tempests in teapots by beginning in a whisper and rising to a flashing, glittering storm," which earned him the nickname of "Signor Crescendo". ↑ Gorlin 2013, p. 119. ↑ Michael Rose 2004, "Mercadante: Flute Concertos", booklet accompanying the RCA CD recording with James Galway and I Solisti Veneti under Claudio Scimone. ↑ The Royal Conservatory of Brussels conserves an autograph reduction of this work for voice and pianoforte in a luxuriously bound edition with gold initials of Olympe Pélissier, Rossini's second wife (ref. Edmond Michotte fund). ↑ "Anecdotes of Rossini" by "E." in Richard Fennell: The London Magazine, Charivari, and Courrier des dames, vols. I & II, p. 370, London 1840. Simpkin, Marshall and Co.
↑ The Edmond Michotte fund of the Library of the Royal Conservatory of Brussels holds an important legacy of Rossiniana, including autograph manuscripts, books and objects. ↑ Weinstock 1968, p. ? ↑ Gazzetta Piemontese,(Italian), 24 November 1868, p. 2: "La sua fortuna di 150,000 franchi di rendita ..."
↑ Gazzetta Piemontese, (Italian), 24 November 1868, page 3. "Io voglio che dopo la mia morte e quella di mia moglie, siano in perpetuo fondati in Parigi ed exclusivamente per i Francesi due premii di tre mila franchi ciascuno per essere annualmente distribuiti: uno all'autore d'una composizione musicale religiosa o lirica, che dovra' specialmente appogiarsi alla melodia, oggi si trascurata; l'altro all'autore delle parole in prosa od in verse, sulle quali dovra' adattarsi la musica ed essere perfettamente appropriate, osservando le leggi della morale di cui i moderni scrittori piu non tengono verun conto." 1 2 Taruskin 2010, p. ? ↑ Checchi 1887, p. ? Gorlin, Sophia (2013). Music Theory for Young Musicians in the Style of Russian School of Piano Playing – Book 5. CreateSpace Independent Publishers. ISBN 978-1483945071. Harewood, Earl of, ed. (1987). Kobbé's Complete Opera Book (10th ed.). London: Bodley Head. ISBN 0370310179. Roberts, Warren (2015). Rossini and Post-Napoleonic Europe. University of Rochester Press. ISBN 978-1-58046-530-4.